CAMPBELLFORD, ON – Church-Key Brewing has announced details of the next release in its Heavy Weight Series of limited edition beers, and its one that continues the brewery’s tradition of using groan-inducing puns to name its beers. Here at Church-Key we have never been ones to fear a non traditional ingredient, so down the rabbit hole we went with our Ooh Mommy Cremini Mushroom Ale. It started with a conversation with another brewer at a conference in Denver and rolled along from there. We made teas out of several different Ontario grown wood mushrooms before deciding on the Cremini. The savory meaty character of the Cremini adds a strange but wonderful complexity to this strong, bronze coloured brew. It’s hop profile is light allowing the candy sweet crystal malt to shine through. 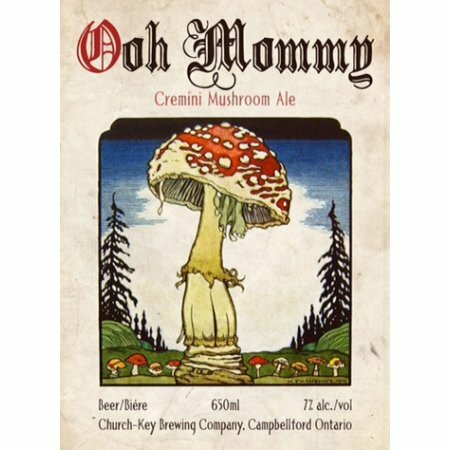 Ooh Mommy Cremini Mushroom Ale was brewed in a single batch of 1000 litres, and is available now on draught at select licensees in Ontario, and in 650 ml bottles at the Church-Key retail store while supplies last. Ouf…a stomach churner… I like most of your products, but this one just doesn’t do it!